I was going to ask you to remind me that there are yarns thicker than a DK (and a needle larger than a 3.75mm) when next I chose to knit a garment. The Ivel was knit on 3.75mm, it's knee length and full sleeved - what was I thinking?? But, like childbirth, how soon you forget the pain. Donna (Randomknits) obtained through one of her yarnpushers a kit for this project in their palette yarn - a Peruvian Highland Wool. She gave it to me as a Christmas present. She started hers a few weeks ago, she'll be finished any minute now but I'm just starting. I have swatched. I have failed to obtain gauge. I do not fully understand the implication of this, but I intend to do so. I have been forced to re-chart the pattern in excel so my eyes can see it. I have even had to invent a Fair Isle Yarn box. 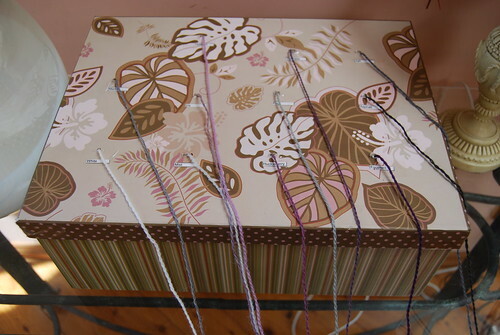 I kind of love it, it's a beautiful box and the yarn almost matches it, let's hope it does it's job of eliminating any tangles that would otherwise have occurred. Not to mention helps identify the colours of the yarns - they all look the same once the ballbands are off. I will conquer this knit. I may even learn to enjoy it. (For the fair isle interested: I knew there was something called 'yarn dominance' in fair Isle knitting, but I didn't have much of a clue what it really was about. I appear to just naturally knit with one colour in each hand, I didn't know how I was going to deal with the two colours at first, but my hands kind of just 'did it'. So, I knit the first half of the swatch with the background colour in my left hand. Can you see how the lighter yarns' little v's (the knit stitches) kind of blend into the darker colours? I also missed a row very early on, but please don't see that.. The second half I switched hands, and knit the background colour in my right hand. It looks much better I think. Ooh, yes, I have a beautiful book called "The Art of Fairisle Knitting" that explains all about yarn/colour dominance and stuff. And the best part is, it includes examples that actually show you how it looks different depending on which colour is in which hand! I can never remember which way is best though, so I just try to make sure that I'm consistent throughout the project. 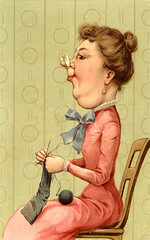 You clever clogs, being able to hold the yarn in both hands - I couldn't get it when I tried! 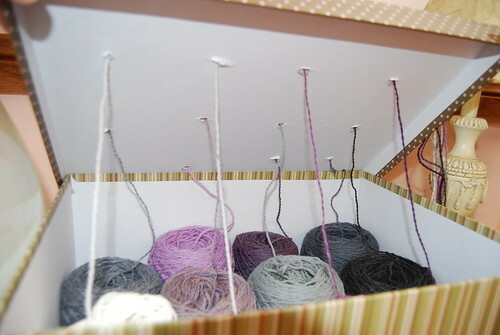 Also good idea with the yarn box! Bet you'll have yours done in no time as well! Oh you lucky duck having natural ambidextrousness for the fairisle!! Woops! Posted under my dh's account. Although he would definitely appreciate the ingenuity of the box. But he's messy. that box is a very good idea!!! 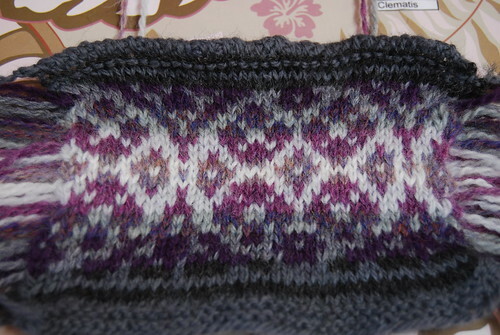 i've never dare to attempt fairisle...they look too complicated!! I love your fair-isle box! What a great idea! That swatch of yours is stunning, too. The colors are fantastic! Looking forward to seeing your progress on this! The box is a great idea! 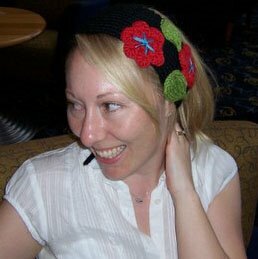 Managing the yarns is one of the reason that I do not like knitting Fair Isle, now you have provided the solution. Thanks.